The vertical drop for a GS course must be 250–450 m (820–1,480 ft) for men, and 250–400 m (820–1,310 ft) for women. The number of gates in this event is 56–70 for men and 46–58 for women. The number of direction changes in a GS course equals 11–15% of the vertical drop of the course in metres, 13–18% for children. As an example, a course with a vertical drop of 300 m (984 ft) would have 33–45 direction changes for an adult race. 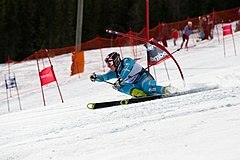 Although giant slalom is not the fastest event in skiing, on average a well-trained racer may reach average speeds of 40 km/h (25 mph). Giant slalom skis are shorter than super-G and downhill skis, and longer than slalom skis. In an attempt to increase safety for the 2003–04 season, the International Ski Federation (FIS) increased the minimum sidecut radius for giant slalom skis to 21 m (69 ft) and for the first time imposed minimum ski lengths for GS: 185 cm (72.8 in) for men and 180 cm (70.9 in) for women. A maximum stand height (the distance from the snow to the sole of the boot) of 55 mm (2.17 in) was also established for all disciplines. In May 2006, the FIS announced further changes to the rules governing equipment. Beginning with the 2007–08 season, the minimum radius for GS skis was increased to 27 m (89 ft) for men and 23 m (75 ft) for women. Additionally, the minimum ski width at the waist was increased from 60 to 65 mm (2.36 to 2.56 in), and the maximum stand height for all disciplines was reduced to 50 mm (1.97 in). The best skiers tended to use a bigger sidecut radius, like Ted Ligety at 29 m (95 ft), and Lindsey Vonn at 27 m (89 ft). For the 2012–13 season, the FIS increased the sidecut radius to 35 m (115 ft) and the minimal length to 195 cm (76.8 in). Many athletes criticized this decision. Often David Dodge was cited. Dodge argues that FIS used studies which do not represent a scientific proof. He states that it is well known that if one tips the ski 7° more the 35 m ski will have the same turning radius as the 28 m ski. He states as well that knee injuries are decreasing since the 1990s, when carving skis started to be used. The first giant slalom was set in 1935 on the Mottarone in Italy, over the Lake Maggiore, near Stresa, on January 20. After one month, the second giant slalom was set on the Marmolada in Italy's Dolomite mountains, by Guenther Langes. The giant slalom was added to the world championships in 1950 at Aspen, Colorado, and debuted at the Winter Olympics in 1952 at Oslo, Norway, run at Norefjell. The GS has been run in every world championships and Olympics since. Originally a one-run event, a second run was added for men at the world championships in 1966, run on consecutive days, and at the Olympics in 1968. The second run for women was added at the world championships in 1978, and made its Olympic debut in 1980. The world championships changed to a one-day format for the giant slalom in 1974, but the Olympics continued the GS as a two-day event through 1980. Also scheduled for two days in 1984, both giant slaloms became one-day events after repeated postponements of the downhills. Following the extra races added to the program in 1988, the GS has been scheduled as a one-day event at the Olympics. Upon its introduction, giant slalom briefly displaced the combined event at the world championships; it was absent in 1950 and 1952. The combined returned in 1954 in Åre, Sweden, but as a "paper race," using the results of the three events (downhill, giant slalom, and slalom), a format used through 1980. The combined returned as a stand-alone event at the world championships in 1982 at Schladming, Austria, and at the 1988 Calgary Olympics. It was changed to the super-combined format (one run of slalom on same day as downhill) at the world championships in 2007 and the Olympics in 2010. Skiers having most podium in FIS Alpine Ski World Cup. Updated to 15 February 2019. ^ a b "The International Ski Competition Rules" (PDF). Retrieved 2017-01-16. ^ Ted Ligety, Skiing's Most Outspoken Critic, Is Still the Best in the World, bleacher report, 2012-10-28. ^ A Letter To FIS, David Dodge, 2011. ^ Unfälle und Verletzungen im alpinen Skisport, David Schulz, Auswertungsstelle für Skiunfälle, Stiftung Sicherheit im Skisport, 2011. ^ Allen, John (2010-01-31). "First Giant Slalom". Skiing Heritage. International Skiing History Assoc. Retrieved 31 December 2011. ^ "GIANT SLALOM - COMPETITORS HAVING MORE THAN ONE PODIUM". fis-ski.com. Retrieved 5 February 2018.